Fall has fallen and with it the end of the Bleed for your Team Blood Drive is fast approaching. 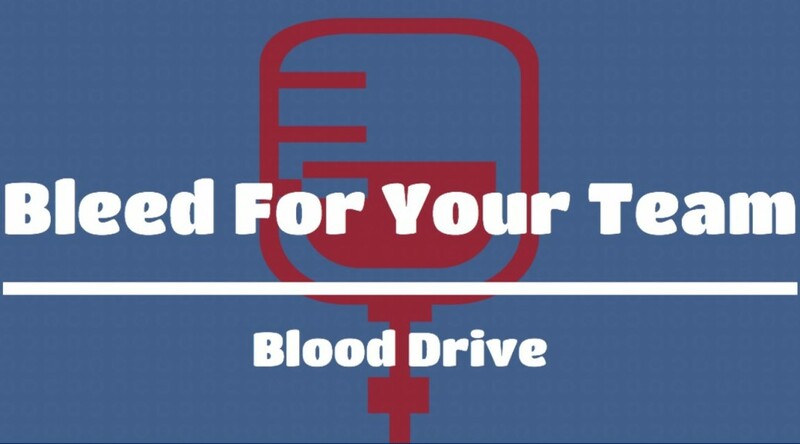 With only one week left to donate as much blood as they (safely) can, which team will give the most for residents of the CSRA? 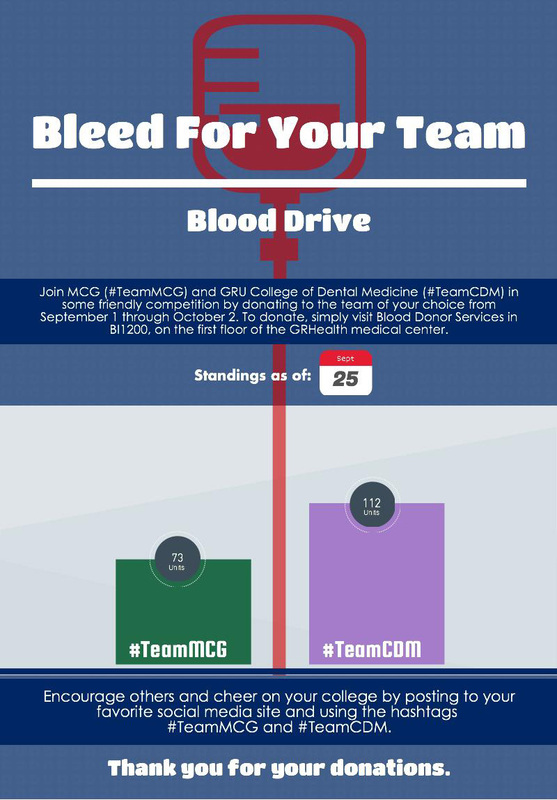 When last we checked in on our college competitors, the College of Dental Medicine had edged out a slight lead over their Medical College of Georgia rivals. Have the tables turned in favor of the Medical Masters since our last Bleed for your Team update? Or will Team Tooth prove once and for all that they are, in fact, the better bleeders? The American Academy of Periodontology Foundation is seeking donations to initiate a new leadership mentorship award in commemoration of the late Dr. Connie L. Drisko, former dean of Georgia Regents University’s College of Dental Medicine and pillar of the field of periodontics. Drisko, who became the CDM’s third dean in 2003, died in June of 2014 after a short battle with acute myelogenous leukemia. In 1995, the Hedwig van Ameringen Executive Leadership in Academic Medicine (ELAM) program was established to help develop a national pool of qualified female candidates for academic medicine, dentistry and public health leadership roles. The mentorship award, formed from the partnership between the AAPF and ELAM, was created to encourage young female periodontists to become executive academic leaders. For more information about the partnership between AAPF and ELAM, click here. 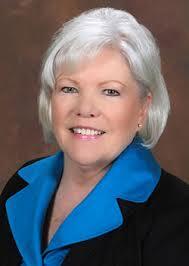 The Drisko-Women in Periodontics Leadership awards will include two award packages. The AAP Foundation-Drisko Young Leader Award will be offered to third-year female residents enrolled in an accredited U.S. periodontal graduate program who are committed to advancing leadership in academia and have been nominated by their program director. In addition, to further recognize and encourage future ELAM alumni to become academic mentors, a cash reward, the AAP Foundation-Drisko ELAM® Fellow award, will be offered to full-time female periodontal faculty who have already been accepted into the ELAM fellowship program. Dr. Christopher Cutler, associate dean for research of the CDM, said Drisko was a visionary leader whose caring spirit has been greatly missed. Donations with a note indicating the gift is for the Drisko Fund can be made at periofoundation.org. AUGUSTA, Ga. – Hand sanitizers are more popular than ever – and so are myths about the products. “We get a lot of questions about hand sanitizers and their uses. Are they safe? Are they effective?” said Dr. Stephen Hsu, a Georgia Regents University researcher with a growing line of green tea products. His start-up biotechnology and drug development company Camellix, LLC, uses green tea-derived technologies to treat dry mouth, dandruff, and cold sores with natural ingredients. Now, Hsu has turned his attention to creating a better hand sanitizer and lotion using compounds derived from green tea. Myth #1: Hand sanitizers only prevent colds. As a result of the research, Camellix plans to donate shipments of its new EGCG sanitizer and lotion to military personnel fighting the spread of Ebola in West Africa. Myth #2: Hand sanitizers replace hand washing. Myth # 3: All hand sanitizers are created equally. Myth # 4: Sanitizers kill all bacteria and viruses. Most bacteria can be killed by alcohol-based sanitizers, but in order to effectively kill viruses, the concentration of alcohol must be very high, or about 90 percent,, which is dangerously flammable. Myth #5: There is no wrong way to use hand sanitizer. Dr. Stephen Hsu, Professor of Oral Biology, Oral Health & Diagnostic Sciences in the College of Dental Medicine at Georgia Regents University, earned a bachelor’s degree in biochemistry from Wuhan University after a six-year forced labor experience in a rural farm in China. After moving to the United States, he earned a Master of Arts degree in molecular biology from Montclair State University in New Jersey and a Ph.D. in cell biology and anatomy from the University of Cincinnati College of Medicine. Dr. Stephen Hsu is founder of Camellix, LLC, which develops and markets products using green tea-derived technologies to treat dry mouth, dandruff, cold sores, and viral infections with natural ingredients. The products were developed and patented in the Georgia Regents University Life Sciences Business Development Center in the Office of Innovation Commercialization. Hsu joined GRU 1999 and serves as Course Director for both Nutrition and Biochemistry courses. He has joint appointments in the Institute of Molecular Medicine and Genetics, GRU Cancer Center, and VA Medical Center Augusta. 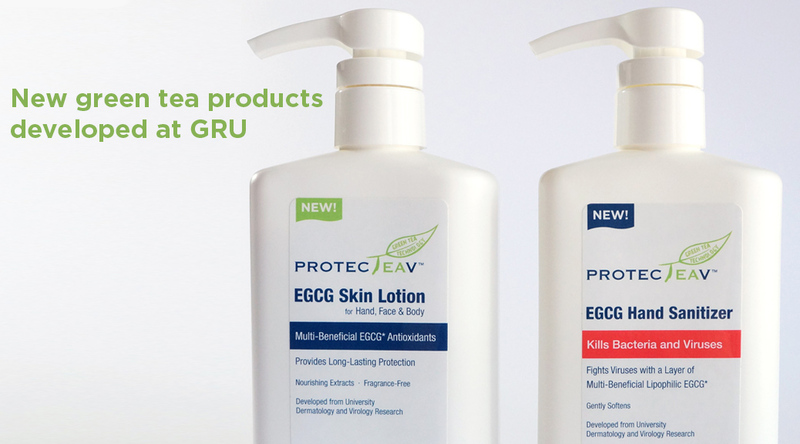 Learn more about ProtecTeaV® EGCG Hand Sanitizer and Skin Lotion at www.camellix.com or the GRU Office of Innovation Commercialization at www.gru.edu/oic. Have you been told you have gum disease? If you qualify to be in the study, you will receive a dental exam, oral cancer screening, dental deep cleaning and monetary compensation. For more information and to schedule a screening appointment, please contact College of Dental Medicine’s Clinical Research Center at 706-721-1270. AUGUSTA, Ga. – More than 1,000 students are expected to participate in Georgia Regents University’s commencement exercises on May 8, at 2 p.m. at the James Brown Arena. This year’s commencement speaker will be Jane Chen, a TED Senior Fellow and CEO of Embrace, a social enterprise that developed an innovative baby incubator solution designed to address infant mortality in developing countries. Medical College of Georgia Hooding Ceremony, 2 p.m., May 7, The Augusta Convention Center, 2 10th St.
College of Allied Health Sciences Hooding and Honors Ceremony; 6 p.m., May 7, Bell Auditorium, 712 Telfair St.
GRU’s Student Government Association will also hold an Undergraduate Ceremony at 8 p.m. on Thursday, May 7, in the GRU Summerville Quad on the Summerville Campus. AUGUSTA, Ga. – The College of Allied Health Sciences at Georgia Regents University will offer a new doctoral degree in applied health sciences – the first program of its kind in the University System of Georgia. This three-year, interdisciplinary doctoral program is designed to equip health professionals with the skills to solve health care issues in numerous fields of allied health. Graduates will be clinically oriented and prepared for roles in evidence-based practice or as faculty in allied health fields. The coursework offers innovative and advanced research training in three concentration areas: rehabilitation science, health care outcomes, and diagnostic sciences. Application deadline is May 31, 2015. For more information, call GRU’s College of Allied Health Sciences at 706-721-2621 or visit gru.edu/alliedhealth. Students from Georgia Regents University’s Colleges of Allied Health Sciences and Dental Medicine provided free dental care to children from a local elementary school as part of the American Dental Association’s Give Kids a Smile Day. Nearly 100 students from Rollins Elementary School and the CSRA EOA Head Start Program received complimentary screenings, fillings, and preventive treatments. 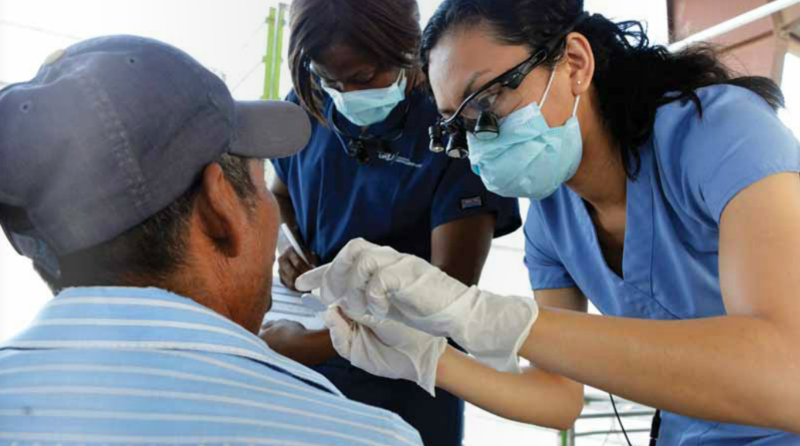 Since 2003, the ADA program has allowed members to partner with their communities to provide dental services to underserved children. Volunteering on Friday, Feb. 6, were about 20 Department of Pediatric Dentistry dentists, residents and staff, and senior and junior dental and dental hygiene students. 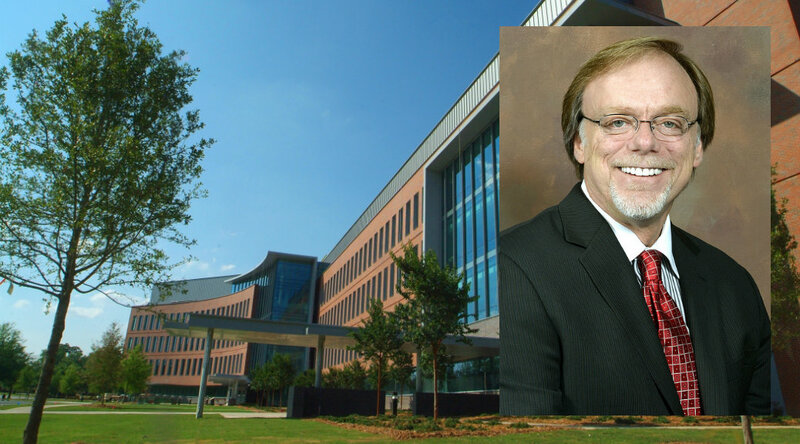 AUGUSTA, Ga. – Dr. Christopher W. Cutler has been named Associate Dean for Research at the Georgia Regents University College of Dental Medicine. Cutler has served as Interim Associate Dean for Research since July 2013 and Chairman of the Department of Periodontics since 2011 and will continue in that role. “We’re grateful to Dr. Cutler for his service as Interim Associate Dean of Research and are delighted to welcome him to his new appointment in the College of Dental Medicine,” said Dr. Carol A. Lefebvre, Dean of the College of Dental Medicine. Cutler holds appointments as Professor in the Departments of Periodontics and Oral Biology. 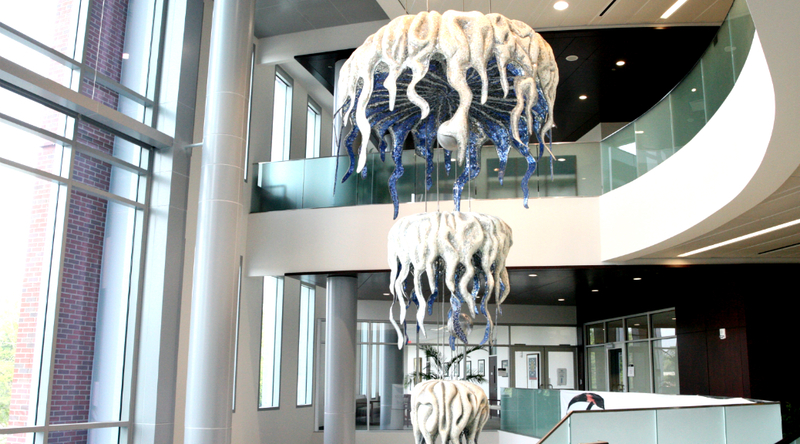 Prior to coming to GRU in 2011, Cutler served as Associate Dean for Research at Stony Brook University School of Dental Medicine in Stony Brook, New York. There he developed and directed the Center for Oral-Systemic Health Research and taught as a Professor in the Department of Periodontology and Implant Dentistry. Cutler also previously taught in the Department of Periodontics at the University of Texas Houston and Baylor-Texas A&M College of Dentistry. Cutler earned his Doctor of Dental Surgery degree and Doctor of Philosophy in Experimental Pathology at Emory University in Atlanta, where he also completed his residency training in Periodontics. Following Emory, he completed a postdoctoral fellowship in anaerobic microbiology at the U.S. Naval Medical Research Unit #3 in Cairo, Egypt, and later further postdoctoral training at the Baylor Institute for Immunology Research in Dallas. 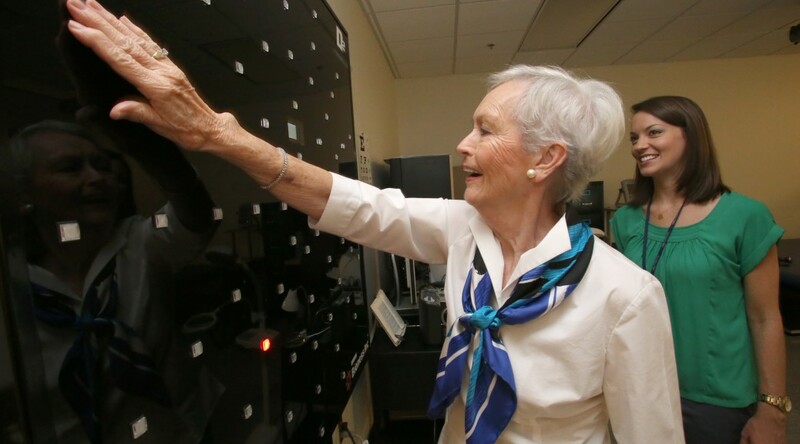 Cutler received the National Research Service Award from the National Institute for Dental and Craniofacial Research in 1987, a Balint Orban award from the American Academy of Periodontology in 1989, and an Edward Hatton Award from the American Association of Dental Research in 1990. While at Baylor conducting research in immunology, he received the first award in the Clinical Sciences Research category at the seventh meeting of the International Academy of Periodontology in Slovenia in 1999. He more recently received the Bernard S. Moskow International Lectureship in Periodontology at Columbia University in 2008. Cabinet makers-turned-dental students . 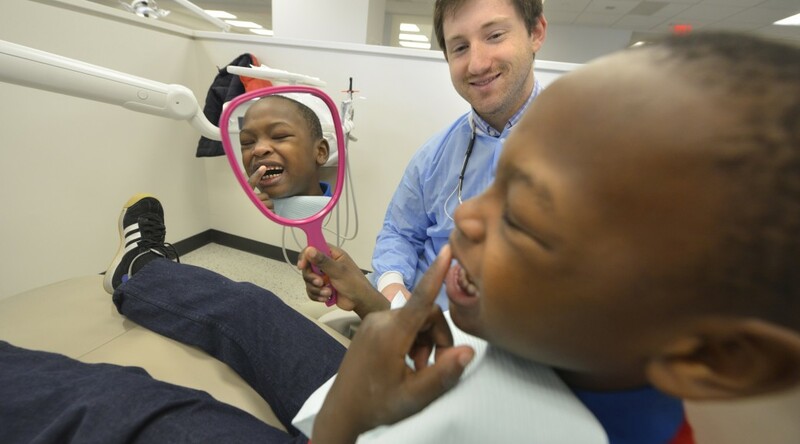 . . dental care for the developmentally disabled . . . class acts in the classroom. . . . These are among the articles featured in the fall/winter 2014 edition of Word of Mouth, a biannual magazine for the GRU College of Dental Medicine. Check it out here, and don’t hesitate to pass along your feedback to Editor Christine Hurley Deriso (cderiso@gru.edu) to ensure we continually put our best foot forward. Click here for Word of Mouth.